We want to make sure that the people in impacted communities don’t ever feel alone or forgotten, and below are just some of the ways we responded to the impact of these storms on our state, our communities, and our neighbors. With so many of our local Partner Agency pantries dealing with infrastructure damage to their own buildings, the Food Bank held emergency distributions in Rockingham, Trenton, Warsaw, Wilson, and Laurinburg, just to name a few. 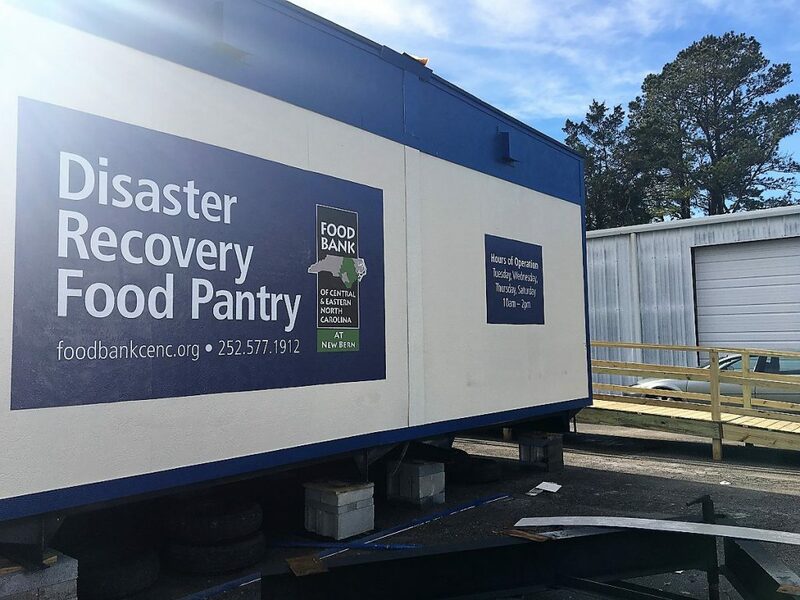 The Food Bank also held a freezer restock and a protein power up in New Bern partnered with groups like the Cajun Navy, Catholic Charities, and the North Carolina Baptist Men and Women to ensure they had food to prepare hot meals. In addition, Food Bank CENC opened a pantry in Trenton to serve the people of Jones County, because storm damage put our partner agencies in that area out of commission. More than 500 truck loads of disaster relief product have been distributed to those affected in 27 of our 34 counties, and helped support our NC sister food banks in 5 counties that were greatly impacted. In addition, staff from other food banks in the Feeding America network came to assist in the weeks and months following the disaster. Some came from our sister food banks here in North Carolina, and some like Latasha, came from as far away as Texas and shared her experience with Hurricane Harvey. Before Hurricanes Florence and Michael hit, Hurricane Floyd was the Food Bank’s largest disaster relief effort. In the five months since Florence and Michael, the Food Bank has distributed twice the amount of disaster relief food and supplies as we did following Floyd. 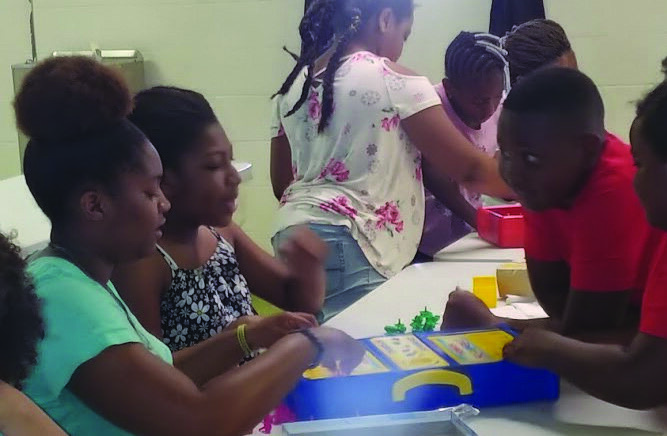 Working with the U.S. Department of Agriculture, the Food Bank extended the Kids Summer Meals program after the storm, so that children who were not able to return to their schools had meals and activities available Partners like Adelphia CDC hosted an extended site to serve breakfast and lunch to kids ages one to eighteen. Generous folks of all ages and parts of the world sent food, funds, and notes of encouragement for those who were affected by the storms– Girl Scout Troops from New Jersey and Pennsylvania for instance. Some companies sent care bags with nonfood essentials like toothbrushes and toothpaste. One local family designed #CarolinaStrong decals and donating the sales, we truly felt the love. Food donors and food drives provided thousands of pounds of food and many people helped with donations of funds, all helping us meet an increased need. Heroes also rolled up their sleeves. Volunteers have donated more than 20,000 hours of time to support the Food Bank’s disaster relief efforts. When UNCW was closed for several days following Florence, International Students put their time to good use, helping prepare food to go out to the community. Everyday heroes weren’t the only ones to join the Food Bank’s effort to help our state recover. Singer James Taylor issued a One Million Meal Challenge. The Avett Brothers headlined a concert in Greenville to benefit disaster relief. And Raleigh chef and restauranteur Ashley Christensen held a private dinner in her home, with food prepared by Christensen and her friend Emeril Lagasse. We’re grateful to everyone for believing in our mission and our ongoing relief efforts as we support recovering communities, for the long haul.